College a cappella choirs are more popular than ever, but at the University of Oklahoma, there’s still only one – The Redliners. Assignment Radio’s Madeline Stebbins takes us inside rehearsals and the minds of some of the Redliners the week before the final concert of the semester. Listen as Madeline Stebbins explains what it's like preparing for a Redliners concert. Madeline Stebbins is an alto in The Redliners. There are 19 Redliners, and every semester they sing pop, rock, and musical theater songs. For some of them this concert is the last one. "It feels like a pretty complete ending, like tying the bow on a present. It’s very neat. I feel good with where the Redliners are." Said Christina Nguyen. She’s the president and a four-year Redliner. Her and Madeline have been standing next to each other for the last three years as the two lowest alto voices in the group. "There have been times when I thought about changing the arrangement," She said "then I thought, no. Madeline and I have to stay together." It’s Christina’s last semester in the group. For Madeline, it’s a little more complicated. She has a class conflict with rehearsal, but there’s a chance she'll be able to come back – next week the officers will take a vote and decide if she can miss rehearsals and still be a Redliner. But for some of the Redliners, this is it. Madeline recorded her thoughts about their progress. "Today’s Wednesday, it’s about 8:20," She said. "I’m getting ready to go to our second day of marathon rehearsal week. Yesterday we had a really good, really productive rehearsal. It felt really good. We’re making a lot of progress on memorizing our music, some of which we have only had for a week and a half, so that’s a really good feeling. The song that I have a solo on is Instant Crush by Daft Punk. We spent a lot of time working on that, which I always love, it’s always really fun to feel like we’re honing that." Madeline's friend Connor arranged a song specifically for Madeline. But as well as she knows the song, and as much as she likes it, she was still terrified she'd forget the words when she finally got up onto the stage. "I’ve always thought that nerves are a good thing before a show – they keep you on your toes," she said. "And looking back on it now, a few days later, I’m glad we were nervous." "Okay, it’s Madeline again, it’s just after 9:30 on Thursday, April… 24th? Today was a little bit of an awakening. We’ve been working a lot the last few weeks on newer songs, like Instant Crush and another one called Clarity. We’ve really been drilling those, and we’ve neglected a lot of the songs that we learned earlier in the semester. Tonight we sang a lot of those for the first time in a few weeks. And they definitely have atrophied a little. They are not what they once were. In the past, at the concerts we’ve had one or two that will not quite crash and burn, but definitely not live up to the standards that we hold ourselves up to. I’m really hoping that this semester, all the work we’ve put in and regardless of how rushed we’ve been at the end, I hope that everything sticks together, everything works. Here’s hoping." "Okay, this is Madeline again, it’s just after noon on Saturday, April 26th. It’s the day of the concert. We just had a morning rehearsal for about an hour and ran through everything in the final order one last time. I’m really excited. I’ve been in five Redliners concerts, and this is the one I think we’re most prepared for, out of all of those. There are a few things that are a little rough, but I think the adrenaline will get us through. I’m really excited, I really hope it’s not the last time that I’m up there with them. 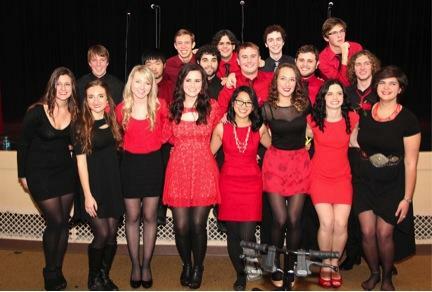 Redliners has been such a great part of my college experience, it’s been such a great community, such a great group of friends, an such a great outlet for singing and music. Everyone is so talented and fun and kind and I can always count on the Redliners. I know that next semester, even if I’m not a Redliner, they’ll still be there for me, they’ll still be my friends. But I really hope I can keep making music with them too." After the show Connor expresses how important the show was to him. "It’s always so great to have the audience there at the end, and this is it for me, this is maybe it for you, but I realized, no, no matter what, we’re pretty much singing for each other," he said. "We get to have an audience for the last run-through of these songs, but as long as we sing it well and we just get into it, it probably won’t matter who’s there afterwards. Because I’m going to walk off the stage and say “we did it!” regardless of whether anybody from out there will know that we did it.."
It’s not about the show – it’s about how we get there.